Villa Sirena is our new home away from home on the beautiful island of Bonaire. Located at El Pueblo, a gated community about 10 min from Kralendijk on the North end of the ilsand. The villa faces South West and offers a stunning view of the ocean and sunset . A few steps down the road you will find Oil Slick, an excellent dive and snorkel site. Villa Sirena is a 3 bedroom home , each bedroom with its own bathroom. Open concept kitchen and livingroom with a large wrap around porch and pool. 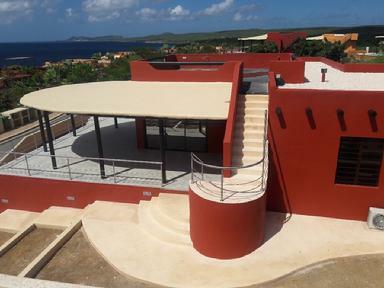 We have a lovely roof top patio, which offers views of Klien Bonaire, the National park and of course the ocean. Villa Sirena will be available for rent 2019.